Today’s pedal line is from Sam Binder. If you have a pedal line (doesn’t have to be in a board) for your rig, please email me a photo, bio, description of pedals and routing to pedalline@nulleffectsbay.com. Every Friday I’ll showcase a pedal line submission. Make sure you include any links to your band or music page. I also wanted to say Merry Christmas to everyone! 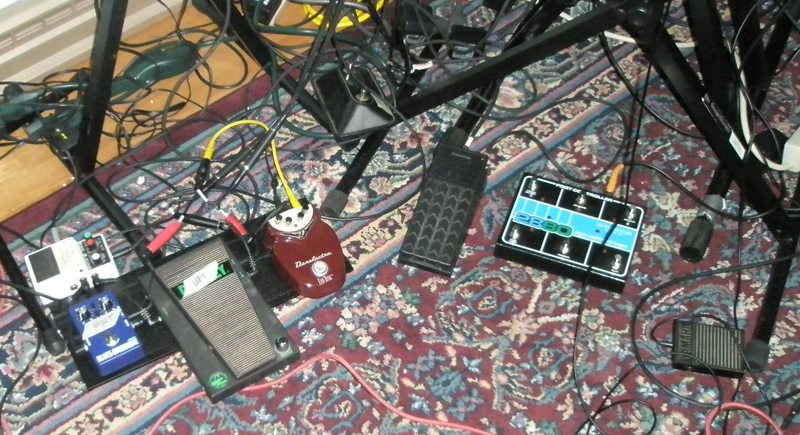 This is my ‘pedal line’, although it includes some stuff that is pretty clearly not pedals. It’s kind of a tangled rat’s nest of cables, but I still manage to play out with it pretty well (although my half-hour setup/teardown time leaves something to be desired). Let’s start with the guitar line. The Boss OC-3 [Super Duper Octave] is probably the worst overdrive pedal I’ve ever owned, but in combination with a fuzz that can re-voice the sound properly, delivers some massive bass [which is probably more what it should be doing anyways]. I also use it to pretend I have a bass that works. Occasionally, I’ll swap it out for a WSoU bitcrusher [the red one hanging out in the top of the pedal board] or a Digitech XBW Bass Synth Wah [envelope follower]. The Cusack Screamer was kind of a fluke purchase- I went into guitar center to putter around with used gear and thought it was an acceptable overdrive for $60. I had just gotten my tax return back so I picked it up pretty much with the intention of flipping it. However, with the drive down, it’s a ridiculously good sounding pre-amp, and in conjunction with the Boss EH-2 at the end of my pedal line, gave me a really good electric guitar sound for when I play direct in to a PA/mixer. I keep it after the octaver because it screws with the tracking on the OC-3. I raise the level control when I play with a slide. The Boss HF-2 I picked up at a pawn shop while I was on vacation in upstate New York. I was staying with some musician friends and got to brag to them that I won at their city [Rochester] harder than they did. It’s a pretty great sounding analog flanger [it’s got an MN3007, if you’re wondering, which would make it similar to the ADA flanger and the DOD FX75B]. It also doesn’t quite sound like a normal flanger, and is definitely worth the purchase if you see one for under $100. Occasionally [generally while recording, or if I’m bored using the same stuff all the time], I’ll swap it out for my EHX Small Stone, but I don’t really like playing out with that one, too worried something will happen to it. The DOD FX90 I picked up on ebay while I was looking for a ‘good’ analog delay. I figured it would be pretty mediocre, given the cheap price (BIN for $40)- no, this is a terrific sounding pedal with the same compander circuit as the Boss DM-2 (slightly different delay circuit, but I’m of the opinion that the analog delay ‘tone’ comes from the compander) and a nice ‘underwater’ or ‘on drugs’ sound is produced. No crisp highs at all, but plenty of terrific sounds. Unless I really want a sharp, sudden sound, I have this pedal on all the time. The DOD DFX9 I got in a trade for a Boss RV-2 and I love it. The grainy, bitcrushed delays sound awesome and glitchy, especially when combined with feeding multiple notes into the octave pedal before it. It’s got the repeat hold function, but I haven’t really played around with it. The Danelectro FAB echo I bought fairly cheap [$20?] from a guy on my message board who mods pedals. The delay times go to about 6.3 seconds and it self oscillates [furiously] with the repeats anywhere near half. I mostly use it for spaceman sounds due to the lone knob mounted on the top that i can bump around with my foot, making wooshes and ‘thumb on the edge of the record’ type effects. The Boss PS-3 is a real gem of a pedal. It’s probably the pedal I’d be most devastated at losing because it’s got a very unique mode (#7) that can sound like strings. I traded a Boss PS-5 for it and i’m 100% certain I got the better deal. No other single compact pedal makes the sounds this one does. to over-ride volume settings [via gain/level controls], resulting in a very ‘limiter-ed’, neutered distortion if they’re the other way around. The Biyang FZ7 is a chinese made pedal that is supposed to sound like a big muff. It fails miserably at that, but, depending on the settings, I think can sound more furious, or, with the gain at the minimum [which, last time I checked, would mute the signal on a big muff], produces a nice, crisp overdrive sound [nice and crunchy]. I’d say the closest pedal it sounds like is a Barber Direct Drive but it’s not really that either. You can order them from the ebay seller hazedconfused or order them directly from Biyang [with a really weird ‘name your price’ type system]. I got mine for about $60. Occasionally, I’ll run a DOD FX76 [punkifier- an overdrive/fuzz combo pedal that sounds like the guitars on the Blur album ’13’] instead, or, if the gig dictates I can’t get rowdy, i’ll replace it with the Biyang TR8 [tremolo], which I don’t really use much but prevents me from indulging in the temptation of blowing away the audience at, say, an art gallery. and, as a result, I had to replace it. The Boss EH-2 is kind of the secret weapon of recording guitar directly. It’s not a DI box, but maybe consider it closer to a cab emulator in terms of sound- not noticeable if it’s there, but turn it off and you’ll know something’s missing. These [along with their DOD counterparts, the FX85 and FX87] pop up on ebay pretty frequently for around $60-100. The Ampliton and FAZE modules [I call them modules because, being made entirely of plastic, with the knobs far too close to the bypass button, you don’t want to stomp on them] are really quite fantastic for the money. Tap tempo on both, plus plenty of options on either. I use the Ampliton in the tap tempo square wave mode [with the autopanner off- they can be synced or independent] so the rate knob acts as a multiplier. I use the FAZE on the ‘classic’ sound and ‘Envelope following’ reaction [you can set those independently] which not only gives a nice ‘swoosh’ to synth leads, but allows for dubstep ‘wobble bass’ when used with the right patch and the FX32. The Moogerfooger…. it is just a dang ridiculous pedal. I dunno. It’s probably the most ridiculous pedal i’ve ever used in terms of effects offered by one ‘box’ without being considered a multi-effects unit. I think it sounds best with my synth (versus my guitar) on account of the synth providing a more predictable sound response without me having to use a compressor/limiter. I don’t really think i’m using this to its full potential, but it’s good for adding bubbly filter sounds to my synth tones. The DOD FX32 [Meatbox] is another pedal I picked up in Rochester [for far below its ebay price]. It is a bass boost with EQs at 30 and 60Hz and a 30Hz synth chip [on a blend control]. 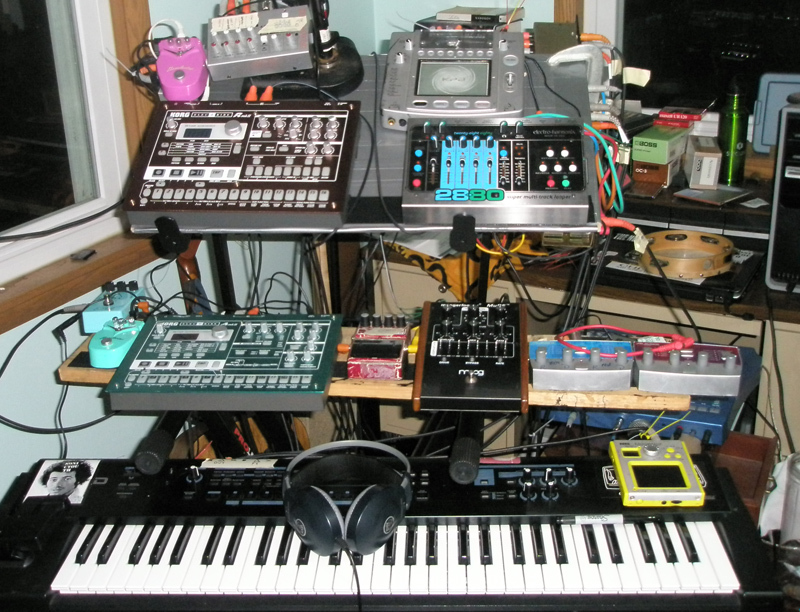 I mostly play with the synth chip blended out of the signal and the others on about 3o’clock. Just gives ridiculous bass emphasis, especially useful for making wubstep or really strong organ bass lines. 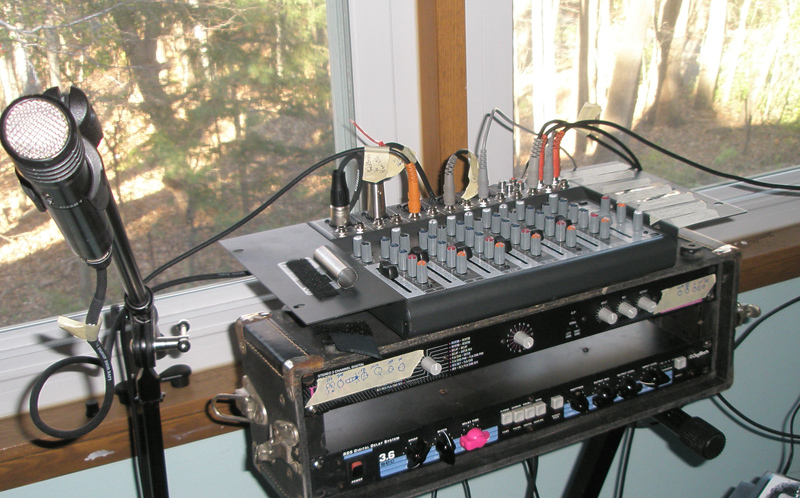 It’s blown out more than its share of amps when attached directly- nowadays I keep some stuff inbetween it and the PA. The Deltalabs Chorus is pretty mediocre, actually. not weird enough to justify having it on for anything but organ modulation, and honestly, I’m really only using it for its true-bypass-ness- as a mute pedal for my synth line. I’m almost ashamed to mention I bought it because the sales girl was cute and making eyes at me. These and vocals are run into a Behringer 1002 mixer [with the vocals having an FX send/return to, in the order applied, a Digitech RDS 3.6 and an ART FXR], along with a Kaossilator in the last channel, each channel’s pan knob deteimining it’s signal route- Left goes to the 2880 Looper, Right to the Nady mixer. The 2880 Looper is midi synched to a Korg ER-1 mkII beat machine [which is in turn hooked up to a midi-synched EA-1mkII, for basslines/bleeps/bloops], which runs through a Korg KP-2. The left and right outputs of the 2880 then go to a Morley Volume [left channel] and a Cheapie Washburn overdrive [right channel] with everything set to zero, to be able to mute individual parts. Those go into a Boss LS-2 to be able to combine the signals into one. The drum machine goes to a Danelectro Chili Dog octaver pedal [for adding sub-bass], then to the Korg KP-2, then to a Danelectro Fabtone with all the knobs set to zero, so I can cut the drums out on songs with a foot [useful when playing guitar].The EA-1mkII has the first synth out running to a Danelectro French Toast, for better distortion than the on-board. This all sounds about as clear as mud, I’m sure, so I’ve attached a signal routing diagram. What’s the red box with the LCD screen? I guess it’s a rehoused delay but not sure..